Nobody wants to lug all those cartons of almond milk and ground turkey from the cart to the car and then to your house. Why not make it a little easier on yourself and use a Click & Carry which can hold up to eighty pounds. Yep. Eighty Pounds. No more worrying about hurting your wrists or fingers while lifting heavy bags. Instead, you can just put the grocery bag handles into the Click & Carry grooves and off you go! Ladies and gents, if you carry a purse/murse to the store, you want to be able to make sure that it’s protected while you wander around the aisles. With the Click & Carry, you just need to click your purse/murse into place to the cart, and the contents of your bag are now safe and protected. Whether it’s the middle of the week or you’re saying #TGIF, we all love a little happy hour action after a stressful day of school or work. With Click & Carry, all you need is a bag and you can carry up to 24 bottles of wine or liquor. YES! 24 bottles! If you don’t believe us, check out the video below. Here at Click & Carry, we love to give back and help those who may need a helping hand. That’s why we love giving Click & Carry handles to organizations like Canine Companions for Independence, a US-based 501 organization that trains and provides assistance dogs. 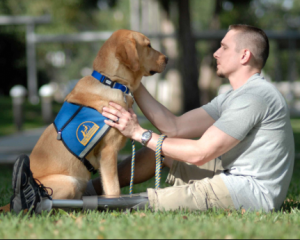 As of April 2017, it has sponsored and trained over 5,000 dogs to help people with disabilities at no charge to the recipient. Our main goal at Click & Carry is to help make people’s lives just a little bit easier. Each Click & Carry is simple, easy to use, and fulfills a consistent need. Grab your very own Click & Carry HERE or on Amazon Prime! As the creator of Click & Carry, Kim Meckwood is one of the many small business owners who are the backbone of America’s economy. She came up with the Click & Carry when she was lugging her groceries up several flights of stairs and knew that there had to be an easier way. And so, Click & Carry was born. It’s the first handle with comfortable gel padding that you can use to carry bags with your hands and also throw it over your shoulder for a hands-free carry. Did we mention its various multipurpose use from carrying groceries to sports gear? Fill a Need in the Marketplace– Kim saw a need for a simple cost-effective device that would allow you to carry bags without hurting your wrists or arms. Instead of being a damsel in distress, Kim saw an opportunity to create Click & Carry so that she could multi-task in a quick and easy fashion. Love What You Do– Kim has mentioned before that she wanted to be her own boss after years of working for other companies. When you have a clear vision of your product and what you want to achieve in your company, it’s easy to do what you love. This doesn’t mean that things will always be easy, but being a true entrepreneur means that you take the roadblocks that come your way and continue to move forward. Persistence is the name of the game. Get the Word Out– Being about to talk about your product wherever you go is a key aspect of being an entrepreneur. You need to not only use traditional media methods like television or web advertising, but also be active on social media to reach customers that now aggregate on those networks. Kim is a seasoned pro with such media appearances including spots on QVC’s In the Kitchen with David, Bethenny, I Want That, and Food Fortunes. With Click & Carry handles on Amazon Prime, as well as Kim being a contender for the 5 Minute Pitch challenge, Kim is seeing her efforts to bring Click & Carry to the next level come to fruition. Onward and Upwards! Click & Carry was created from a place of necessity, but also a place where I wanted to create a self-sustaining business where I would be my own boss. After years working for various companies, I had reached a point personally and professionally where I wanted to take the leap. And Click & Carry was born. Starting a business is not an easy task, but I truly believed in my product and it was gratifying to see how quickly Click & Carry took off. We were featured on QVC where it sold out quickly as well as being featured on various network tv talk shows. But without the capital to really grow my business, Click & Carry’s growth slowed down as well. But I never gave on Click & Carry. We’ve kept our business moving forward and now sell on Amazon Prime, as well recently pitching Click & Carry to various successful entrepreneurs on ‘5 Minute Pitch,’ for the chance to win $50,000 to kick-start my business. Last week, my episode aired and I’m happy to report that Click & Carry will be moving onto the deliberation round! The lesson is…when you truly believe in your dream, don’t ever give up. The team here at Click & Carry is so excited to see where our product will go. Thank you to @5Minutepitch and to everyone who has support us!